Movement is based on the visual, vestibular system and proprioceptive systems. The brain uses this information to create a 3D map of your body and your environment. Once you know who you are and where you are, you can decide how to interact with your environment. Vision + Vestibular + Proprioception = Movement. Assessing the cranial nerves can provide as with all kinds of information regarding the patients health. I divide my assessment into the visual, vestibular and proprioceptive systems rather than going through a dull CN 1-12. 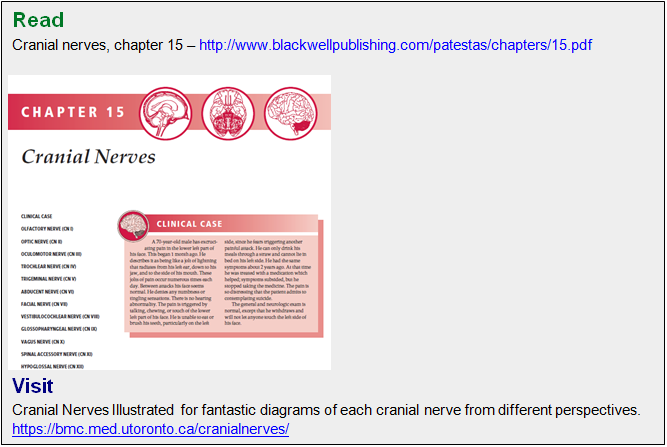 This system makes the assessment and relevance of the cranial nerves easier to remember and understand. Examine the visual system in patients with neck pain, headaches, a history of falls and those who have experienced a head trauma. Can the patient bring a target into focus and keep it in focus? – Test vision with a Snellen chart. – Direct and indirect pupil reflex. – Check visual fields – don’t wiggle your finger. – Size, shape and symmetry of the pupils. – Check the H. Hold each position for a few seconds. Looks for gaze stability and smooth pursuits. – Cranial nerve 4 weakness assessment. 1. Look for head tilt. Return head to neutral and look for a hypertropia (high eye). 2. 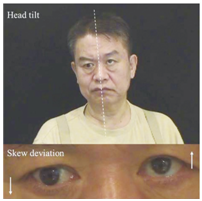 Tilt head in opposite direction of the head tilt and ask if the patient has double vision. 3. Return to neutral and move the target in the direction of the head tilt, observe for a hypertropia and ask about double vision. Cranial nerve 2 lesion: Peripheral or central vision loss. Cranial nerve 3 lesion: Partial or complete ptosis, strabismus (eyes moves down and out), dilated pupil which is unreactive to direct light, loss of accommodation. Cranial nerve 4 lesion: Head tilted away from the lesion. Vertical double vision. Cranial nerve 6 lesion: Unable to look laterally. Horizontal double vision. The outermost image disappears when covering the affected eye. Remember that vision, vestibular and proprioception from the head will be paired with proprioception from the body. Try to isolate and challenge each system and check how they interact. The role of CN 8 is to tell us where vertical is and which direction we’re moving. – Look for head tilt or rotation. – Vestibulo-ocular reflex. Horizontal, vertical, right anterior with left posterior and left anterior with right posterior. – Head thrust in horizontal and vertical. – Romberg’s eyes open, head neutral, head left, right, up and down. Repeat with eyes closed. – Single leg stance eyes open, head left, right up and down. Repeat with eyes closed. – Gait – gait width should be no wider than 10cm. Arm swing should match leg swing. Add a cognitive task to bring out errors e.g. say everything month of the year or subtract 7’s from 100. – Weber’s and Rinne’s hearing tests. All proprioception from the head will enter the trigeminal system. All pain from above C3 will enter the trigeminal system. CN 5-12 tell us about the health of the pons, medulla and upper cervical spine. – Check sensation of the face and blink reflex. – Ask the patient to say ‘ahhh’ and look deviation of the uvula. – Push tongue out and hold. – Shrug shoulders and turn head. Look, feel and test activation of SCM and trapezius. Cranial nerve 5 lesion: Reduced sensation in the face. Weakness of the jaw, jaw deviates towards the side of weakness. All pain above C3 synapses into the spinal nucleus of 5, nociception from any structure above C3 can cause headaches. Headaches can cause neck pain. Loss of proprioception from the extraocular muscles of the eye and jaw can cause changes in postural stability. Cranial nerve 7 lesion: Upper motor neuron lesion causes weakness of the lower half of the face. Can be activated by volitional and emotional areas of the brain, CVA may spare emotional activation but lose volitional. Lower motor neuron lesion causes ipsilateral paralysis. Supplies skin behind the ear, Bell’s palsy can present 1-2 days before facial paralysis with pain behind the ear. Loss of taste from anterior ⅔ tongue. Cranial nerve 9 lesion: Loss of sensory part of gag reflex and taste posterior ⅓ tongue. Loss of carotid sinus reflex. Check blood pressure lying and standing in patients with dizziness and hypermobility. Cranial nerve 10 lesion: Palatal weakness – uvula moves towards the normal side, ‘nasal speech’, palate moves asymmetrically, hoarseness of voice and loss of volume. Cranial nerve 1 and 12 don’t supply vision, vestibular or proprioception but they do provide important information. Clinical Examination – use easily identifiable smells e.g. coffee. Avoid using spicy smells as they may activate CN 5 instead. Lesions – loss of sense of smell, change in taste. Important to check this after head injury, patients with suspected Parkinson’s disease, dementia and severe depression. Clinical Examination – observe for wasting, fasciculations, with protrusion the tongue will deviate towards the affected side in an lower motor neuron lesion and away from an upper motor neuron lesion. Lesions – weakness/wasting of the tongue.